The forest was old, and the magic hidden underneath ancient boughs and wisping over the rushing rivers and thick meadows was even older. It thrummed beneath the earth’s surface like a beating drum, and it glistened like early morning dew on the plants and rocks within its domain. It was alive and powerful, and sixteen-year-old Meaghan could feel the magic beckon her as she stood just outside the forest’s borders in the predawn morning. Dressed in a loose linen tunic, a plaited leather belt and boy’s tweed breeches with her auburn tresses braided and tucked up tight in a woolen cap, she could have passed for a wood nymph—slender, petite and nearly blending into the forest around her. But, upon a closer examination, you could see she was not tranquil enough to be a creature of the forest. A few copper strands of hair escaped her cap, and her green eyes sparkled like the mist-covered moss. Her skin was fair, and she had a smattering of freckles across the bridge of her nose. She held a long, sturdy walking stick in her hand, and her feet were bound in fine leather boots that helped her move soundlessly in her surroundings. Shivering in the cool morning air, she inhaled the sweet nectar of the old magic, but waited carefully outside its borders. She looked up impatiently, watching as the sky above her transformed from night to day, turning from dark grey to soft lavender, as thin shrouds of clouds replaced the last few stars. Turning, she looked back across the path she had just taken. The spires of the stone manor house were beginning to glow with the pinkish-gold hue of sunrise. Slowly the shadows of night withdrew as the tide of light made its way over the slate tiles, like a wave slipping onto the shore. It swept over the house and onto the manicured grounds. Spilling forward, it followed her path across the lawn, over the fence and across the meadow. It revealed her walking path through the thick wild flowers and clover, a thin line of darker green where the grass had been crushed. Finally, it reached the edge of the forest. Meaghan lifted her face, closed her eyes and let the warmth of the sun seep into her skin. She inhaled deeply. She loved the unique scent of the forest, the moist, rich smell of earth, the spicy scent of pine and the musty combination of old and new plant growth. Slowly opening her eyes, like a sleepy cat, she sighed with the pleasure of the moment. But a rustle in the woods behind her reminded her of her task, and, with a little regret, she turned from the warmth and faced the woods. Waiting until the glow of the early morning sunlight glimmered on the path and gilded the leaves of the trees in front of her, she finally took her first step inside. She knew enough of the stories and legends of the forest to not enter its lands until the sun had lit the sky. Those fae creatures that dwelled here, although harmless enough during the day, were focused on mischief and mayhem when the lesser stars and the moon ruled the sky. She smiled to herself. With her leather satchel of supplies hitched over her shoulder, she had set out early that morning to construct a little mischief and mayhem of her own. Moving farther into the forest, she felt the same welcoming sensation she always felt within the borders of the dark woods. Although most from the village avoided the mystic area, Meaghan had always felt a protective spirit within its confines, as if she was coming home. Birds swept through the sky above her, darting from tree to tree, welcoming the new day. From the high-pitched trill of a waxwing to the soft purring of the turtledove to the hoarse call of a crow, their songs filled the air in a discordant symphony that reminded Meaghan of the ware-hawkers at the village market. Cherries for sale, cherries for sale. Buy a posy for your lady, buy a posy for your lady. Cold ale, cold ale. Grinning as she pictured the villagers’ reactions to the birds wearing aprons and hopping around the square selling their goods, she decided it would probably be wiser for them to remain in their forest home. As she moved farther in, timid but curious forest dwellers, like deer and rabbit, paused for just a moment to observe the intruder and then darted away into the thick old growth leaving no trace of having been there a moment ago. 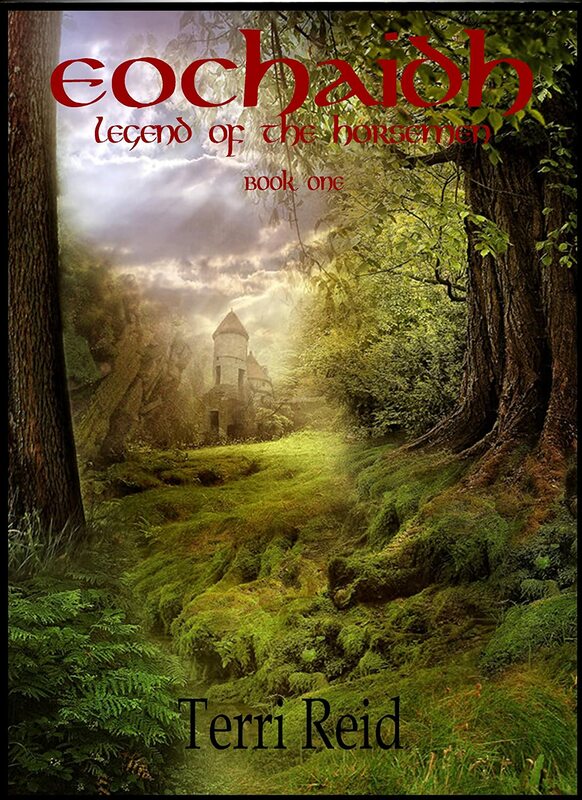 Although the main path through the forest was well used, a wide, worn strip of brown pounded earth, the path Meaghan choose was covered with a green carpet of moss that rolled over stones, logs and ground and with very little evidence of being used at all. She walked carefully but quickly on the grassy moss, moving from stone to log to stone again with a dancer’s dexterity, grabbing onto tree trunks and thick vines to help her keep her balance. The path angled downward, heading toward the bank of the river. That was her goal, the clearing just before the river. There was a score to settle that morning, and, she decided with a determined nod, she would be the one to do it. Her heart pounded in excitement. No wonder the earthly creatures had hushed. The fae were speaking. Green fairies were about. She had been told about the green fairies, how they tended to the flowers and plants in the forest. They sang as they worked, their voices like tiny pure chimes, and their morning song was a rare treat. Watching them work was even more rare. She looked back over her shoulder to the rising sun. Surely she had time enough to find them before she put forth her plan. Unlike most of Britain, the people in this Irish village spoke of the fae on a regular basis, simply because there were all kinds of fae that actually lived in the woods and the surrounding countryside. Meaghan learned as a child it was because these woods used to be a favorite of Merlin the wizard, when he was not near Camelot. The older villagers said he left some of his magic in it when he disappeared thousands of years ago. She liked that she could feel the magic; it was like Merlin was still there. Meaghan watched her until she disappeared into the leaves of the trees. With a satisfied sigh, she turned and quickly headed back to the path. She had a lot to accomplish in a short amount of time.